Are these terms able to be used interchangeable? No – not at all. Recycling is the act of taking a product, breaking it down and remaking that same product…. such as paper scraps become paper. Cans become cans. Nothing innovative here… just reusing the raw material again and again. While this was the first popular idea with the green movement, recycling is a valuable process that keeps countless amounts of things from the landfills. Most garbage hauling companies are active in the sorting and staging of raw materials for recycle. Plastic water bottles, and aluminum cans find new life melted down and reapplied to the production line. Old tires become filler for road paving projects. The garbage companies have a huge job to keep their limited space for dumping utilized efficiently, and effectively. Garbage is on my mind because we recently attended a town hall meeting for our city. We are approaching conversion from our own trash cans to the large 95 gallon beasts that separate actual garbage from items to recycle. In that meeting i was surprised to learn that there is only one landfill in the metropolitan Cleveland area, and it costs 4.5 million dollars to open a land fill area, in compliance with EPA requirements. Each landfill vault holds only a 2.5 year space for actual garbage. So that explains the crazy push to r educe land fill waste by recycling what can be recycled. The presenter had us cracking up because he said until the late 1960s landfills were exactly that… dump it all, let the lightening strike and let it burn for as long as it will, then bury it in and pile it higher, repeating the lightning and burning as nature will. But the EPA now keeps a tight grip on the standards to regulate land fills. Such wild acts of recklessness are no longer tolerated because the garbage dumps can damage water tables, wells, living quality for those around the dumps. 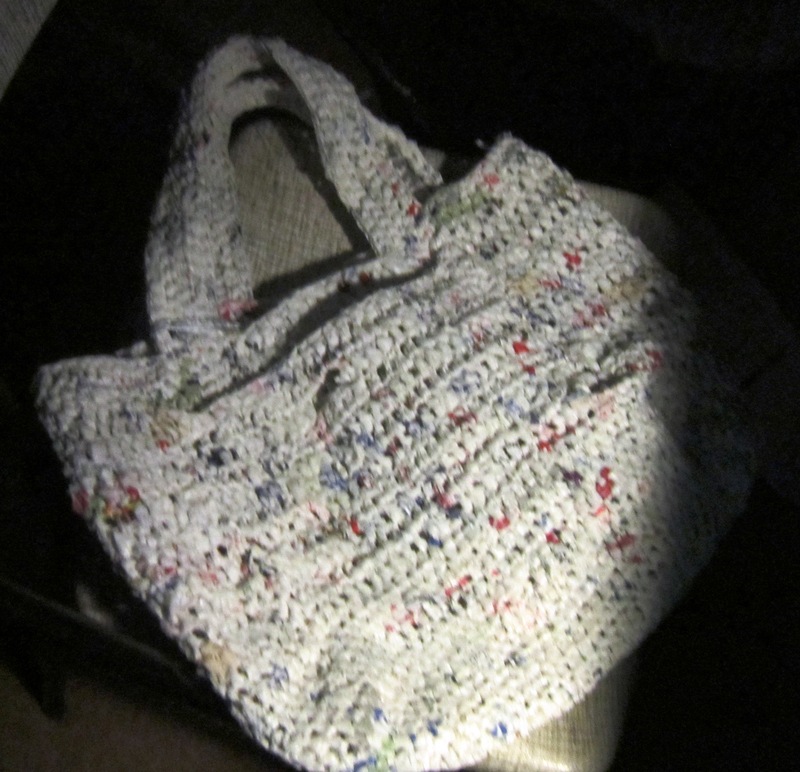 White Market Rebloomer- Made from repurposed plastic shopping bags, created into yarn, and crochet into a market bag for shopping or beach. Upcycling – Upcycling is defined as taking a used or no longer needed item, and finding a new purpose for it. The example i go to is the plastic shopping bags. Most offer one pass in this life, carrying home groceries, or other merchandise, but are then often tossed in the trash. I take the bags, break them down into yarn, and crochet a tote that will be with you for a few years, and give you strong life purose… not heading to the land fill. As we look around our world upcycling is one of the most hot topics i nthe art world… adaptive reuse of materials that would have otherwise filled those expensive garbage valuts… saving on garbage space, and showing your creativity. Here are a few fun photos of ideas for upcycling. (I think we all had a mom that did this kind of thing, without the fancy new title). I would love to hear your thoughts on upcycling… is that something you can see yourself doing, or have done? Write and tell me about your projects… or even upload a photo… visual is always fun. So here are a few ideas i found searching the internet. Old bath tub – new mid century fashion statement couch!!! Love this, and it is going to be hard to find them soon – old light bulbs become vases (or plant starters). old ladder – statement bookshelf. Old grater becomes pencil cup hung on a wall.